Description: Forming dense, brownish-red tassel-like tufts of sparingly branched erect, uniseriate hair-like filaments. Cells oblong, 3-4 times as long as broad. Several plastids, each with a pyrenoid, against cell wall. Reproducing by monosporangia, all year around. Tetrasporangia occasionally formed in winter. Habitat: On limpets (Patella , mainly P. vulgata) on exposed shores and epiphytic on Codium fragile in the lower intertidal of exposed and semi-exposed coasts. Commoner on western and south-western coasts of Britain and Ireland than records indicate; south to Morocco. Adriatic. South Africa. Australia and New Zealand. 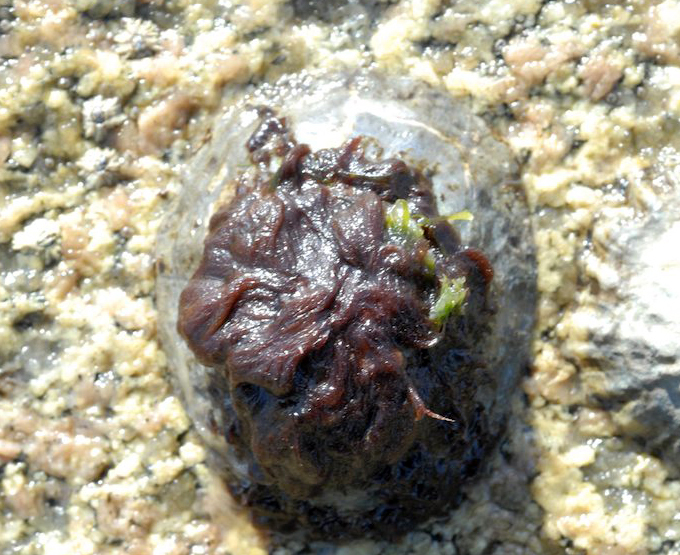 Similar species: Rhodochorton purpureum and Rhodothamniella floridula which are do not occur on limpets, are generally turf-forming and do not form monosporangia. Key characteristics: Association with limpets; tasellated growth form of tufts. Abundant and large monosporangia. Site © M.D. Guiry 2000 - 2019. Important copyright notice: all text, design and photographs on this site are copyrighted by M.D. Guiry unless otherwise stated and all rights are strictly reserved. Click here for copyright information and contact. Website design: 249 Design Studio. Site maintained by M.D. Guiry (michael.guiry@nuigalway.ie). There have been 8736726 page loads since 1 January 2014 on 25 April 2019.